Henry Trousdale was born in Bilsdale in 1884 the son of John Trousdale, farmer and his wife Alice Ann (nee Garbutt). In the census records for both 1891 and 1901 Henry was recorded as living with his parents and siblings at Beacon Guest, Bilsdale Midcable. Although his parents and 4 of his siblings were living at Ellemire, Bilsdale in 1911, Harry is not with them and has not been found on the census return. Henry enlisted in Stokesley on 12th December 1915 at which time he gave his address at Ellemire, Bilsdale and his occupation as farm labourer. His age was 31 years and 6 months and he was single. He was 5’ 9 ½“ with a chest of 37½ “. His next of kin was his father, John. Henry Trousdale was placed in the Army Reserve and was called to the regular army on 17th May 1916. His medical examination at that time gives us the information that he was 5’ 9 ½“ with 37½ “ chest and weighed 158 lbs. His occupation was given as horseman and farmer. Private Trousdale was sent to Newcastle and was at Gosforth camp from 24th May 1916 until 16th May 1917 when he went to Usworth Camp. He elected to join the 81st Training Reserve Battalion and was allowed to retain the 2d a day supplement in pay that Pioneer Battalions received after 1916. Henry embarked at Folkestone for Boulogne on 30th May 1917 and transferred to the 22nd DLI (Pioneers) on 14th June 1917. He served in this capacity for less than a month. On 2nd July 1917 Private Trousdale was killed in action “In the Field”. Henry had made a will dated 24th June 1917 leaving everything to his mother, to whom all his possessions were sent. These comprised: purse, cigarette case, knife, wrist watch (broken), guard and strap, 2 cap badges, fountain pen (broken), disc, small chamois-bag. Henry Trousdale was awarded the British War Medal and the Victory Medal. His body lies in the Belgian Cemetery Battery Corner which is 2 miles south west of Ypres. George Tweddle (or sometimes Tweddell) was born in 1894 in Guisborough, the son of Thomas Cole Tweddell a house painter from Bury, and his wife Mary Ellen (nee Rickaby) from Ingleby Arncliffe and in 1901 George was living with his parents and one younger sister in North Row Stokesley. By 1911 George had 2 younger sisters and the family had moved to Riverside, Stokesley. George attested for the RAMC on 31st August 1916 when he was 22 years and one month old. His occupation was listed as postman. He was then 5’ 9½“ tall with a 32” chest and he gave his next of kin as his father. George was placed in the army reserve and mobilised on 31st October 1916. He was posted to the “N” Company on the 2nd November 1916 and transferred to the No 8 Company RAMC, York on 20th December 1916. He was granted 5th Rate, Corps Pay, 4d on 27th January 1917. His military character was very good. We know little of his career, but he was not discharged until 8th March 1919, when he was diagnosed with heart trouble which was aggravated by war service. His degree of disability was classed as 30% and he was granted a pension of 8/3d. Prior to this discharge, George Tweddle had been at Killingbeck Military Hospital, Leeds, but whether as a patient or medic is unclear. His discharge document shows his last post was at Stoke War hospital, Newcastle under Lyme, and that his home address was Riverside, Stokesley. George Tweddell died on 12th June 1953, aged 59. At that time he was living in Arthur Street Great Ayton. Administration was granted to Mabel Tweddell, spinster, his sister. The only person of this name to have been born in Stokesley district in the appropriate period was Joseph North Tyreman born in 1890. He was the son of Thomas Tyreman,from Kilgram, near Masham, and his wife, Mary. In 1891 he was living in Ormesby with his parents and 3 older brothers. In 1901 Joseph was still living with his parents and 4 siblings at “Five Houses”, Crathorne. Joseph’s place of birth was given as Nunthorpe which was in the Stokesley district. In 1911 he was a boarder, working as a groom for Arthur Webster a farmer at Morton Carr, Nunthorpe. He attested at Stockton for service abroad on 31st August 1914 into the 5th DLI. He was 24years and 5 months, old, married and a miner. He was 5’ 8 ¼ “ with 36” chest. His next of kin was his wife Mary, Kenmirs Buildings, Cornforth Lane, Coxhoe. He had married Mary A Hebden in the June quarter 1914 in the Sedgefield district. He went to France on 17th April 1915 and returned home on 26th June 1915 after receiving a gunshot wound to his right thigh on 23rd June. He was transferred to the 1/5 DLI on 19th September 1915 changing his regimental number to 200218, and returned to France on 21st September 1915. He made a will on 22nd September! He received the British and Victory medals and the 14/14 Star. There is no Arthur Usher born or living in Stokesley in census returns, and the only surviving army record for an Arthur Usher is a medal card. However, the name does appear on the Stokesley Absent Voters Lists in 1918. It seems that the most likely person to be on any local lists is the Arthur Usher who married Sarah Ellen Smith in Stokesley in 1908. There are several possibilities as to the background of Arthur Usher, but the most likely scenario is that of the Arthur Usher born in Middlesbrough in 1887, the son of Anthony Usher, a horse driver, and his wife Eliza. In 1891 Arthur was living with his parents and 4 older siblings in St Hilda's in Middlesbrough and the census of 1901the family was living in Marton Road in the St John's area of the town. Arthur's father was working as a rolleyman in the chemical works, Arthur was an apprentice bootmaker and all of his siblings were in employment. In 1911 Arthur now married and with two young children – Arthur Stanley born in Thirsk and Margaret born at Seamer, Stokesley - were living in Furnace Cottages, Carlin How, where Arthur was working as a weighman at the blast furnace. Arthur must have volunteered fairly early in the war as he arrived in France on 31st July 1915. He was Driver T3/025848 (horse transport) and a member of the Army Service Corps (ASC). We know from the sparse records that we have found that he was promoted to Sergeant T3/025848 and was attached to 49th Field Ambulance which served on the Western Front during some of the bloodiest battles in history. 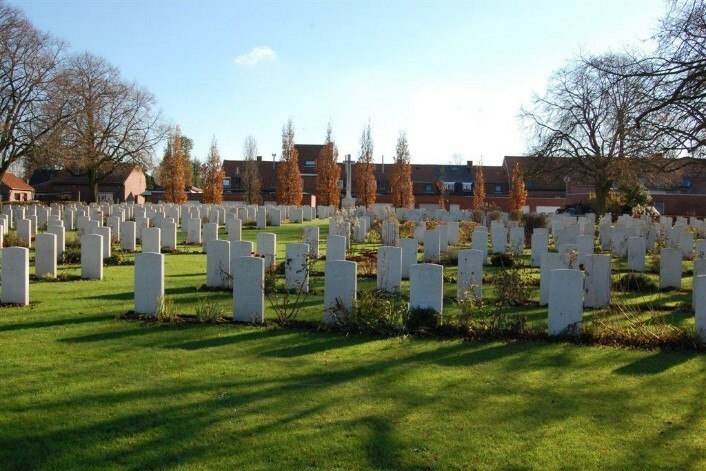 The work included locating and bringing in wounded men, treating injuries and sickness and clearing casualties and establishing cemeteries. The work was dangerous and far from pleasant. Sgt Usher was awarded the 1915 Star, together with the British War medal and Victory Medal. Arthur Usher, age 38, occupation farming; his wife, aged 36; their son Arthur, aged 16, occupation farming; daughter Margaret, aged 15, domestic; son James, aged 13, scholar and son Leslie, aged 8, scholar. James Kenneth had been born in Middlesbrough in 1913 and Leslie in Stokesley in 1917. On 4th April 1937 Arthur, Sarah and Leslie returned to England from St John New Brunswick. Their intended destination was Stokesley. Arthur’s occupation was club steward and Leslie was a general worker. The next time we hear of them is ten years later, so it may be that they spent the Second World War in England. Be that as it may, on 2nd February 1947 Arthur (now a miner) and Sarah returned again to Canada, sailing from Southampton to Halifax. Their final address address in England seems to have been Ivy Cottage Stokesley. We are unable to access records from Canada and their later history is unknown to us. A birth for a John Henry Wainwright was registered in the Tadcaster district in 1875, the son of an agricultural labourer. Unfortunately from the point of view of proof, there was another John Wainwright born in the same area the following year, the son of a butcher. However, as 'our' John was in Beckside Stokesley in 1911, when he described himself as an agricultural labourer, we are tentatively identifying him with the elder of the two John Wainwrights mentioned above. In 1911, then, John Wainwright was lodging in Beckside, Stokesley with Annie Elizabeth Foster, (the mother of Frederick Dunning Foster - see Foster F D, one of the Stokesley Fallen). John joined the armed services in Northallerton on 20th March 1916 as F29213 of the FDASC (Forage Department of the Army Service Corps). The form he filled in was a special one, for men over the age of 40 years or those certified unfit for combat. John gave his age as 40 years 11 months and his address as Beckside, Stokesley. He declared he had never previously served in any capacity within the armed forces. His term of enlistment was 'the duration of the war'. The terms and conditions were a strange mixture of military and civil. John would have been subject to military discipline but he was paid according to the rates of pay of workers in society at large - labourers for instance would receive 2s 6d per day and 2d per ton (of grain) handled. Forage workers were specifically debarred from allowances for lodgings, dependants, rations, separation etc, from army pension rights and from 'any gratuity on enlistment or discharge'. They were provided with a uniform (for which they had to pay!) and were liable to National Insurance contributions! John was discharged on 10th August 1916, 'his services being no longer required'. We are indebted to Ralph Barker of Stokesley for information used in this mini-biography. Ralph's father was the grandson of John's parents, and is listed as such on the 1911 census. (See below) and John was therefore Ralph's great uncle. John Walton was born in 1877 in Seamer, where we find him listed in the 1881 census living at Harker Hill as John W Walton aged 3 years. John's parents were Ralph Walton (farmer of 118 acres, born at Kirby Misperton) and Mary Bielby (from Settrington) who seem to have married in Malton district in 1862. In the house with John and his parents in 1881 were John's seven older siblings and one farm servant. The birthplaces of his siblings show that Ralph and Mary had lived in various locations since their marriage, but it seems that after John's birth they settled at Seamer. Ten years later the Walton family is again listed there, and John was a 'scholar', and even in 1901 when he was 23, John was listed as a 'farmer's son', still living in the parental home ar Harker Hill. John's father died in 190 but John continued to live with his mother, who is listed on the 1911 census as a 78 year old widow and a farmer in her own right. With her we find John and three of his siblings, all unmarried. Also at the house is the 10-year-old Ralph William Barker, scholar, Mary's grandson, born at Upsall. John volunteered to serve soon after the war broke out, and joined the Yorkshire Hussars as Trooper 2791. He was sent to France where he arrived on 16th April 1915. A Trooper Walton is mentioned in the diary of his regiment, as being sent with another trooper 'to the binder', presumably on a quest for straw for the comfort of the horses. (This entire diary seems pre-occupied with the well-being of the horses - naturally for a mounted force). As the war unfolded, mounted troops were increasingly seen as less necessary, and the Yorkshire Hussars were dismounted and trained as infantry. Their men were transferred to other units and John Walton became Private 236037 in the West Yorkshire Regiment. An apparent change of heart on the part of the General Staff led to the Yorkshire Hussars being reformed as a separate unit once more, and John returned to his old regiment as 330481. Although none of John's other service records appear to have survived, we do know that following his discharge he was awarded the British War Medal, the Victory Medal and the 1915 Star. John returned to Seamer where he became known as a little bit of a local character. He was a keen supporter of the local hunt, which earned him the nickname of 'Tally-Ho Jack'. Later in life and fond of a pint or two, John could frequently be found in the King's Head Inn at Seamer, sitting in a corner wearing his top hat, and greeting other patrons politely, raising his hat as he did so. Many and welcome was the generous request to the bar man '…and one for the old gentleman in the corner'! Jack lived till 1952, dying at the age of 75. Ernest was the brother of Wilfred Ward (see below). He was born on 1st December 1894 at Eryholme, the son of William Ward, a farm labourer, and his wife Jane. In 1901 Ernest lived with his parents and 4 siblings at West Farm Cottage, Eryholme. By 1911 the family had split following their father’s death and Ernest was working as a farm servant in Eryholme for Harry Benton, farmer. Ernest enlisted on 3rd March 1916 and was placed in the reserves. He was called to duty on 25th April 1918 and was posted to the 3rd Battalion Yorkshire Regiment. At this time he undertook a medical which states that he was 5’3”, 138 lbs , with a chest of 36”. Private Ward was posted to the 13th Battalion Yorkshire Regiment on 31st August 1918 at Aldeburgh. By this time the war on the Western Front was moving in the Allies' favour, but the some of the Allied governments decided that they would move troops into Russia in support of the Tsar, and against the country's new Communist regime. So, on the 15th October 1918 Private Ward embarked at /Dundee for Western Russia, arriving 28th November 1918. He remained with the armies of intervention until August 1919, when opposition to the policy at home convinced the government that there was no appetite in Britain for a war against the Russians. On 4th November 1919 Ernest was discharged as Class Z. He received the Victory Medal and the British War Medal. However, Ernest re-enlisted into the 5th TF Yorkshire Regiment (Green Howards) in November 1920. At that time he was 25years and 10 months old and a farm labourer. He was 5’ 4”, weighed 147lbs with a chest of 36”. He had brown hair, brown eyes and a fresh complexion. His next of kin was his wife, Mary. (Ernest had married Mary at Middlesbrough Register Office on 13th May 1918, after being called up for duty). Their son, George William was born later that year. At that time their address was 66 Stockton Street, Middlesbrough. Ernest was discharged from the TF on 9th November 1922 at the termination of his period of engagement. Wilfred Ward was born in 1898 and was the younger brother of Ernest Ward (see info on Ernest Ward above). Wilfred joined from the army reserve in Middlesbrough on 31st July 1918 when he was 20 years and 3 months old. He was 5’ 5 ½" tall with a 35” chest and weighed 138lbs. His physical development was stated to be good and it was recorded that he had a scar on his chin and a birthmark on the back of his neck. His next of kin was his mother, Jane, of Bridge Lane, Stokesley. He was single, a farm labourer and stated that he wanted to join the Royal Field Artillery. On 1st August he was posted to the No 1 Depot RFA in Newcastle. Two days later he was posted to 2 Reserve Battery RFA. Wilfred was later posted to the Tank Corps Depot, Wareham on 7th September 1918 and to the Reserves there 2 days later. On 21st September 1918 Wilfred was posted to the 19th Tank Corps. This was at the very time that tanks were proving to be the crucial weapon in the final Allied advances on the Western Front, which resulted in the armistice of November. The fighting over, Wifred was posted back to the Depot at Wareham 2 months after joining 19th Corps. The army was not finished with Wilfred and on 17th December 1918 he was attached to the 505th Agricultural Company at Richmond Barracks. Unfortunately he was then hospitalised for a month with an in-growing toenail. In March 1919 he was transferred to he 407 Agricultural Company until June of that year when he returned to the 19th Tank Corps. On 1st July he was approved for first class proficiency pay and on 1st January 1920 he was re-classified for first class proficiency pay in accordance with AO 368 1919. In March 1920 he was transferred to Class Z for demobilisation. His home address was then given as Greenhow Moor Farm, Nunthorpe. Wilfred Ward married Sarah Selina Paylor in Stokesley in 1926 and they had at least 3 children – Thomas 1926, Margaret, 1929, and Jean 1932. George William West was born in Stokesley in 1893, the son of George William West, chemist and wine and spirit merchant, and his wife Clara (nee Williamson). In 1891 George senior had a shop in the High Street next to the Greyhound Inn1. By 1901 Clara had been widowed but was still living with her 2 children in the High Street. Clara was described as an employer, so it seems she was running the business herself. In 1911 George was living in premises next to the Dog and Bull Inn1 with John Hoggarth, a pharmacist’s manager. George and 2 others were apprentices there but it seems that the pharmacist's shop was still owned by his mother. George W West is registered as marrying Sarah W Barker in Morpeth in 1914, and there are 3 subsequent West/Barker births registered in Stokesley – John S (1916), Edward E (1920) and Maurice G (1923). According to a family tree on Ancestry the West/Barker birth of William Noel (1915) in Eaglescliffe is also the same family. George W West lived until 1973. Arthur Francis Westbrook was born in 1882 in Hutton, Guisborough, the son of Henry William Westbrook and his wife Elizabeth. Henry was described as a “cartman at the Hall gardens” and he came from Winchester, whie Elizabeth was from Medstead which is also in Hampshire. In 1891 he was living in The Cottage, Hutton with his parents and 6 siblings. In 1901 Arthur was listed as a painter journeyman, but was still living with his parents and 5 siblings at Park Cottage in the same village. Arthur married Annie Hardy in Chester le Street in 1908 and in the 1911 census they were recorded as living in West Green, Stokesley with their 2 young sons, Alexander E and Arthur L. Arthur senior was working as a domestic chauffeur. They stated that they had had 3 children, all of whom were still alive. (Records show that a Winifred Westbrook was born in Chester le Street in 1908). The Westbrooks had at least 3 more children in Stokesley – William R (1912), Wilfred L (1914) and Vera (1916). From Arthur's war records, only his medal card survives, but it shows that he was a volunteer as it tells us that he arrived in France on 2nd December 1915. It further states that he had served with the Army Service Corps (ASC) throughout the war. From the 1918 Absent Voters List we find that he was actually serving as Private M2/137012 with 37th Field Ambulance at that time, while his family were resident on South Side Stokesley. The prefix to his regimental number tells us that he was with the Mechanical Transport Special Reserve. Private Westbrook was awarded the 1915 Star, the British War Medal and Victory Medal. and was demobilised Class Z on 5th July 1917. Arthur Westbrook later moved away from Stokesley. He died on 20th May 1959 at 87 Latimer Road, Chesham, Bucks. Probate was granted to Alexander Edward Westbrook and Wilfred Laurence Westbrook, garage proprietors1 and Thomas Ernest Burden, agricultural merchant. 1Westbrook's garage is now a listed building and is currently a cycle shop. John Robert Wilson was born in Ingleby Cross, Stokesley District in 1874. In 1881, he is recorded living with his parents John (a gamekeeper) and Ann at East Harlsey. He had three older siblings and a younger sister. As John Wilson is a common name it is difficult to trace his movements with certainty. However, on 2nd September, 1895, he married Edith Fletcher (b 1875 in Rosedale) in the Parish Church at Skelton and in the census of 1901 the couple were at Wharton Street, Skelton. John was then an ironstone miner, and he and Edith had three children and a boarder, Isabella Bean. Ten years later John was still at the same address and with the same occupation. The 1911 census return tells us that John and Edith had had 12 children of whom only 5 survived. These remaining children were all in the household with their parents. When the Great War began, John Robert Wilson attested for the army on 12th September, 1914, giving his age as 40 years and one month - amended by a later hand to 42 - and his occupation as miner. He declared previous service of 10 years with the 4th Yorkshire Regiment (Territorials). John was placed in the 4th Reserve Battalion with the number 2627. His description on enlistment gives his height as 6'1" and his weight as 11 stone 2 lbs. His chest measurement was 35.5" and he had a dark complexion, brown eyes and grey hair. His eyesight was excellent and he was an Anglican. He gave his wife as next of kin and his address as 6 Ground Hill Cottages, Skelton. He named only two dependant children, Isabella and Bessie. (Another daughter, Nancy, was born in December 1914). John was sent to France on 18th April 1915 where he remained until 19th December of the same year, when he returned to England. John was before the Army Medical Board on 24th August 1916, and he was discharged the following month and awarded a pension of 5 shillings per week with a further 1s 6d per week for his 3 children. This was on account of aggravation caused during his war service to injuries received prior to enlistment - he had suffered leg injuries in the pit in January 1914, and had lost a finger in 1894. In 1917, this pension was increased to 8s 3d plus 3s 9d for the children. He was also granted a gratuity of £27 10 shillings. Strangely, the Army records show that John applied for his medals but do not list the award. From his service we would have thought that he was entitled to the 1915 Star, the British War Medal and the Victory Medal. He was also entitled to th Silver War Badge. Richard Wilson was born in Stokesley in 1897 and in his attestation he gave his father’s name as Richard too. In all likelihood he is therefore the Richard Wilson who in 1901 and 1911 was living in Stokesley with his grandfather James Wilson (from Easingwold). (James had a son Richard who was born in 1872 and who in 1901 was a widower, also living in Stokesley. Richard senior remarried in 1902, and lived in South Side with his new family). Richard Wilson junior attested in Northallerton on 19th February 1916 when he was 23 years and 9 months giving his place of birth as Stokesley. He was listed to join the Forage Department, RASC but was struck off strength on 5th Dec 1917 as there was no trace of him having served there. Another document shows that a Richard Wilson attested in Stokesley on 19th February 1916 aged 23 years and 8 months. His address was Beckside, Stokesley and his occupation was hay bailer. He was placed in the army reserve until he was mobilised on 1st July 1916. He was 5’ 8½" tall with a chest of 33½ “ and weighed 130lbs. His next of kin was his father, Richard. Whether both documents refer to the same man is unclear, but it seems likely. It is difficult to see how such a mistake could have been made in the records office, and it therefore seems much more likely that Richard was not enamoured with the prospect of joining a forage company, and decided to enlist again in a fighting regiment. Richard Wilson was posted as Gunner to 1 Depot Royal Field Artillery the next day. He was further posted to 55 (R) Battery RFA on 13th July 1916 and sent to France on 24th November 1916 where he joined the 106 Brigade RFA. In the final months of the war, Gunner Wilson was attached to the Corps Mining School for 2 weeks on 2nd August 1918, and then hospitalised in Boulogne with 75 Field Ambulance from 26th October 1918 to 20th December 1918 with a bullet wound to his right arm. If he had indeed enlisted twice to get into a fighting unit, he paid a price for the honour! When Richard left hospital the war was over and he was posted to the 60th Reserve Battery and was demobilised on February 13th 1919. His permanent address as a civilian was given as c/o J Wilson, Levenside, Stokesley. Richard's military record was spotless, with no “offences” of any kind against his name. Gunner Wilson was awarded the British War Medal and the Victory Medal. Research suggests that Richard Wilson married Venus Grange (daughter of Francis and Jane Grange) in 1919 in Stokesley and that they had several children, including Richard (born 1920), Margaret (1921), Hannah (1923), Alexander (1924), James (1927), Dennis and Morris (1930) and Jean (1932). It would therefore seem certain that Gunner Wilson has descendants living locally, and if so we would be glad to receive and publish any further information which they might wish to provide. Robert Wilson was born in Easingwold in 1886 the youngest son of James Wilson, a licensed hawker, and his wife Margaret. He was also the uncle of Richard Wilson (see previous). In 1891 Robert was living at West End #blue|Stokesley## with his parents and 4 siblings, but in 1901 we find him living in South Side, Stokesley with his widowed father, sister Anne and nephew Richard. By 1911 Robert's arrangements had altered once more and he was living with his brother Richard and Richard's family in South Side. Robert appears to have enlisted in the army twice - perhaps because he did not sign to serve abroad the first time. He first attested for “One year’s Embodied Service at Home” in Stokesley on 13th September 1914 aged 29 years. Robert stated that he was a labourer and that he had lived away from his father's home for 3 years in Hebdon Yard, Stokesley. He also stated that he was married and had previously served for 4 years with the Volunteer Battalion, 4th Yorkshire Regiment. His next of kin was his wife Bridget. He had married Bridget Burns on 18th July 1912 at St Joseph’s Roman Catholic church in Stokesley. They had one child at the time of his enlistment, their daughter Cora born 25th March 1914. (Robert and Bridget went on to have other children, Margaret Ellen in 1917, Violet in 1919 and Una in 1922). At Robert's army medical he was recorded as 29 years and 7 months old, 5’ 8 ½“ and weighing 155½ lbs. His chest measurement was said to be of 36¾ “ and he had dark hair, brown eyes and a fair complexion. Robert's religion was recorded as C of E despite his Roman Catholic wedding. Robert Wilson was transferred to the 24th Battalion of the Yorkshire Regiment on 29th May 1915. However, on 12th May 1916 he was discharged from this unit for re-enlistment to the 16th (TW – Transport Workers) York and Lancs Regiment in Clacton (Essex) as Pte 26224. Pte Wilson does not appear to have served abroad with either regiment. Indeed, the terms of enlistment for men in TW battalions meant that they could not be sent to serve overseas or be transferred to other units. Quite often TW units were made up of men who were not fully fit. The 16th TW York and Lancs Battalion was formed in Colsterdale in March 1916, before moving first to Durham and then in 1917 to Catterick where it remained. The transport workers battalions supplemented civilian labour wherever there was a proved shortage in the ports, railway centres, canals, and iron and steel works in the discharge of cargoes. They were solely used to supplement proved deficiencies in civilian labour, and on no occasion did they ever compete with civilian labour, nor were there any disputes with civil labour in regard to the employment of men of the Transport Workers' Battalions. The Transport Workers' Battalion scheme was inaugurated with the sanction of the War Cabinet in May, 1916, one battalion being then formed. Early in 1917 the number of the battalions was increased to a strength of 5,000 men, and ultimately to an effective strength of 35,000. The men did some 5,712,200 days' work throughout; they handled 27,341,000 tons, they earned £2,069,245 of civil pay, and 178 while so working saved £980,000 to Army funds by paying for their own food and billets. The work of the battalions again and again stopped a port becoming blocked. I am glad to say that the scheme was a complete success from the start, and from all reports received by the Port and Transit Executive Committee the battalions maintained a very high state of efficiency as units of the Homo Defence Army. Will the Hon. and Gallant Gentleman consider the granting of some honours to this wonderful battalion of workers to-morrow? This battalion has already received some thirty-two decorations, and fourteen more have been recommended. I hope my hon. Friend's suggestion will receive favourable consideration from the authorities. Other documents reveal that concern was expressed in 1920 by the York and Lancs Regiment about Robert's previous service as he “has not been included on any Yorkshire Regiment medal rolls” and they asked Robert to confirm that he had been Pte 2385 of 4th Yorkshire Regiment prior to 13th May 1916 in order to correctly compile the British and Victory medals roll. Robert appears to have lived until 1969. Thomas Wortley was born in 1877 in Middlesbrough district. In 1881 he was living in North Street Thornaby with his mother Margaret, an older sister and a younger brother. Ten years later, Thomas was in Guisborough with his father Joseph, a hawker from Norfolk, his mother (who was born in Whitby), the elder sister and four younger siblings. In 1900, Thomas married Elizabeth Wilson in Stokesley and in 1901 they were living in Cail's Yard, Stokesley. Thomas was recorded as a general labourer and Elizabeth was a 'dealer in hardware on her own account'. In 1911, they were living in North Road, Stokesley. Thomas was described as a hawker, but Elizabeth was apparently no longer a hardware dealer: despite eleven years of marriage they had had no children. Thomas attested at Richmond on 31st July 1916, just at the time when news of the catastrophic losses on the Somme was making headline news across the country. Thomas became Private 32757 in the Yorkshire Regiment; he was later transferred as Pte 27429 in the East Yorkshire Regiment and later still to the 14th Leicestershire Regiment as Pte 60441. On joining up, Thomas was 40 years and 11 months old and still a hawker by trade. He was 5'9.5" tall and 141lbs in weight. His chest measurement was 37" and he was described as of 'fair' physical development. His eyesight was not very good, and the records say that he was illiterate. Thomas was also suffering from an old ankle injury and required dental treatment. Nevertheless, Thomas served for more than two years, all in Britain, before being discharged 28th August 1918 as 'no longer physically fit for war service'. At discharge he was described as of fresh complexion, with blue eyes and dark brown hair. His home address at this time was given as Beckside Stokesley, and his testimonial gave him a good character - 'sober, honest and reliable'. A report on Thomas in May 1918, when he was stationed at Withernsea in the East Riding, tells us that he was disabled due to an old haematoma of the right thigh. This resulted from a kick by a horse at Hill House Farm, Welbury near Northallerton whilst on 'agricultural furlough'. This had resulted in Thomas spending two weeks in bed under the care of the local doctor. He later had two more weeks treatment at Cardiff barracks and was put on lighter work. The doctor noted that Thomas walked badly and said that if what Thomas had told him was correct, the disability (which was reckoned at 20%) was due to service in the present war. He was awarded a pension of 5s 6d a week for 13 weeks pending an enquiry to the TA concerning the circumstances of the injury. On 8th October, 1918, he was given £29 in lieu of the former award. Thomas was awarded the Silver War Badge to mark his service.